【FREE Tail Light Included】- Both of bike headlight and bicycle tail light included in the package, which give your bicycle stand out with unmatched 360º visibility, protecting you and your loved ones are safer in any low light conditions. Instantly improve your visibility & safety with our Ultra Bright LED bike light and the taillight. You will be shocked and amazed at how bright it is! 【Multifunctional Bike Light】- Except being a 360 degree cycle rotating torch for a bicycle, the mini safety flashlight can also be mounted on the included head strap mount as an emergency flashlight for outdoor sports such as trail riding, camping, fishing, hiking, trekking, hunting, night flying, sailing, caving, commuting and etc. Besides, you can use this bike headlight as a regular electric torch in hand.You will be shocked and amazed at how versatile it is! 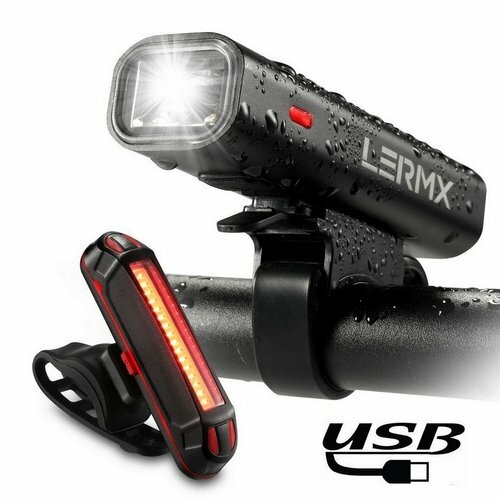 【Order Now With No Risk - LERMX comes with 180-DAY worry-free warranty (REPLACEMENT or FULL REFUND include shipping fee) and lifetime nice customer service; If you are looking for some ultra-bright head light / Extremely versatile and durable/ Lightweight / Long runtime / Waterproof USB rechargeable headlight, please buy it with no hesitation! LERMX gets something you want. If you have any questions about this product by LX LERMX, contact us by completing and submitting the form below. If you are looking for a specif part number, please include it with your message.